This machine features the E³ Integrated LCD™ System which has a touch screen technology for easier workout adjustment. Also including an FM radio it has up to 125 available TV channels to keep you fully entertained. This treadmill comes with a 4.0 HP AC motor with MagnaDrive™ motor controller that is capable of up to 14mph with a maximum incline of 15%. This speed and elevation would be enough to give users of any fitness level a very intense workout. The 20”x60” running surface is the standard size of Life Fitness commercial treadmills. It is big enough to make users of all shapes and sizes feel comfortable during their workout. This DX3™ belt and deck system also comes with FlexDeck Shock Absorption System that has 8 large Lifespring™ shock absorbers to reduce stress on your user’s joints while running and help prevent injuries. Just like the 95Ti, this machine also boasts 28 workout programs that include 5 ZoneTraining+™ workouts for more exercise variety and flexibility. Additionally military PRT/PFT training, Gerkin and Fit Test protocols are built-in to give you better knowledge of your body’s capabilities. Other features include a reading rack to place magazines, an accessory tray to hold sports bottles, personal stereo holder for stereos, over-moulded tubular steel ergo bar to keep users balanced, and a Polar® Telemetry (chest strap required) and Lifepulse™ Digital Heart Rate Monitoring with DSP (Digital Signal Processing) for a better heart rate workout. The Life Fitness 95Te treadmill takes all the quality advances of the bestselling treadmill of the 95Ti and adds superior upgraded electronics. 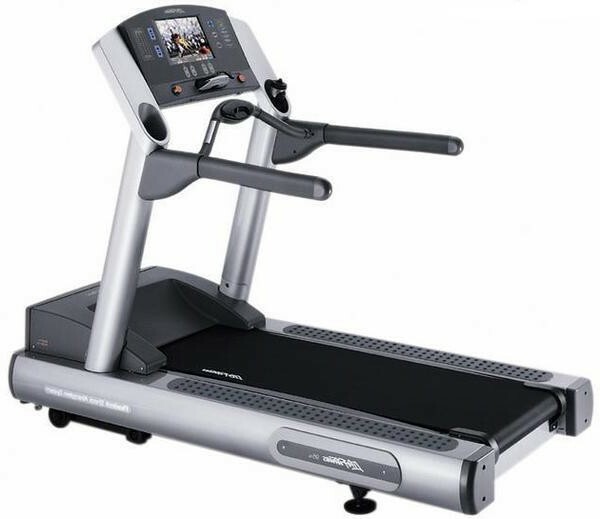 The Life Fitness 95Te treadmills basic features are exactly the same as the 95Ti’s, but the Life Fitness 95Te comes with one of the most advanced LCD Displays available on today’s market. Powered by an Intel microprocessor, you will find a GUI (graphical user interface) along with an integrated help menu. Just like on the 95Ti, you’ll feel secure with ergonomically correct handle-bars and non-slip side rails. All in all, the Life Fitness 95Te treadmill takes the exciting looks of the 95Ti and adds a beautiful LCD console.